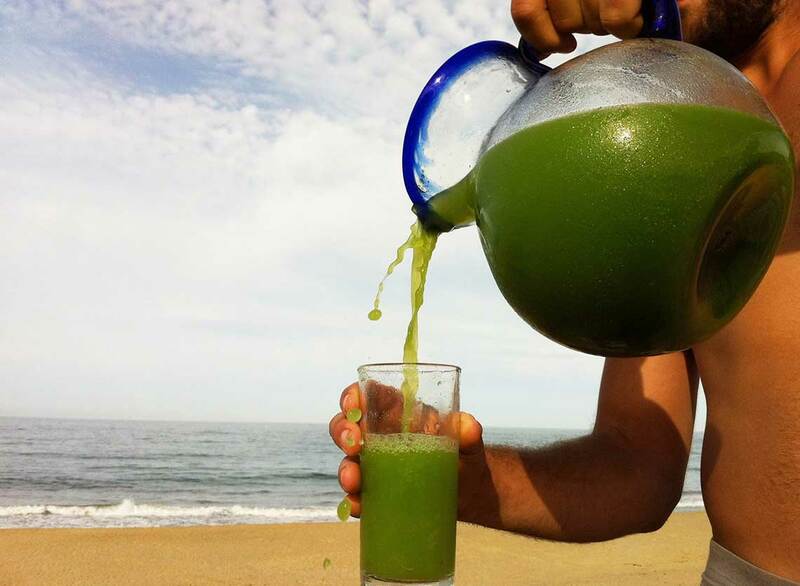 It is also known as „skinny green shake“ – extremely popular – many Hollywood celebrities start their day with this shake. It provides plenty of vitamins, fills you up with energy – it is a mixture of lettuce, spinnach, celery, apple, pear, strawberries, banana, kiwi and lemon juice. Combinations are numerous, and this meal made in blender in just few minutes is an excellent breakfast, brunch or dinner. Add some ginger, celery leaves, parsley, peper, fresh mint leaves…Squeezed juices are very popular as well, but nutricionists accentuate – never to squeeze, always blend. By squeezing fruit you are left with only the sugar and some vitamins, but all the fiber is thrown away. It is true that the veggie smoothie is quite tasteless. On the other hand zucchini with some fruits is a good choice because you will get a spumy drink. The most important advice from experts is never to peel off vegetables and fruits that can be eaten with a peel (apples, cucumber, zucchini…). Just wash the peel thoroughly before using it. By doing so you will preserve the most of nutritient ingredients for your smoothie. Put lettuce and water in the blender and star by slowly blending it, then spped up and add other ingredients. How to enjoy your fruit meal?